One day out of nowhere, high schooler Yuichi Sakaki begins seeing words above people's heads. It turns out to be the ability to see people's true natures, which he names... Soul Reader! The next thing he knows, he's surrounded by people with bizarre labels like "Zombie" "Vampire" and "Witch." And before he can figure out what to do about that, he finds himself threatened by a beautiful girl, Natsuki, whose label is "Serial Killer"! Fortunately, Yuichi is not unprepared. His big sister has been training him for this kind of thing all his life. The battle is about to unfold between the bloodthirsty killing machine... and the world's strongest little brother! 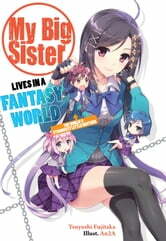 Books related to My Big Sister Lives in a Fantasy World: The World's Strongest Little Brother?! I think, this is the first full light hearted comedy light novel that was released in english. The others are either going with an overarcing story or with some serious stuff or drama. But this one isn't one of them. It's just the comedy that comes with the 8th grader syndrome or "Chuunibyou". The entire cast that was introduced in the first volume is quirky and likeable. You probably won't see some breath-taking character development, but this isn't necessary for this story to be enjoyable and worth your time. If you want a story driven light novel, than this might not be the right title for you.